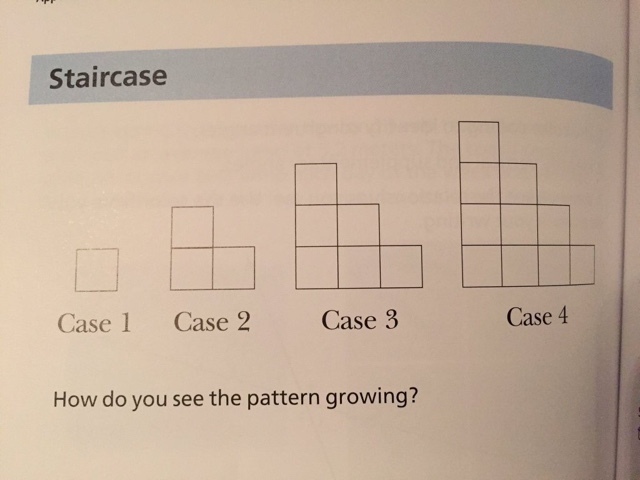 I have been doing much professional reading about mathematical mindset (Jo Boaler, www.youcubed.org) and saw the following pattern in one of the books. 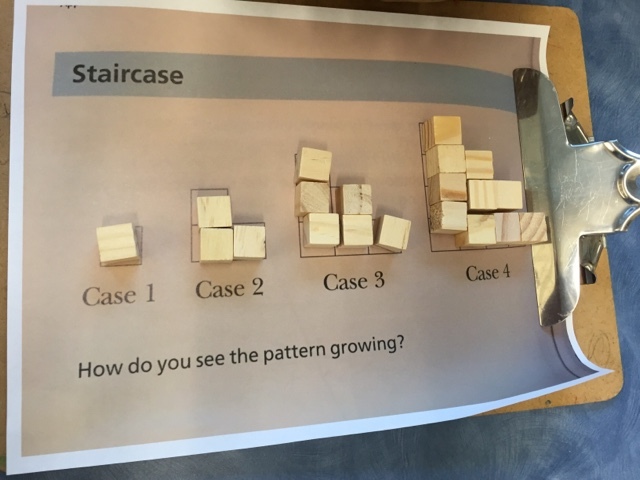 I was fascinated by the math potential of the question and thought this activity might be something that would be of interest and a challenge for our children. 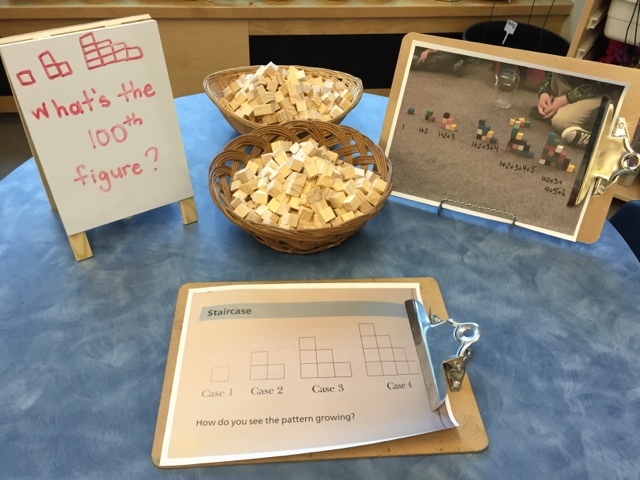 After presenting the question during our morning message, we tweeted our ideas about the pattern and figures. 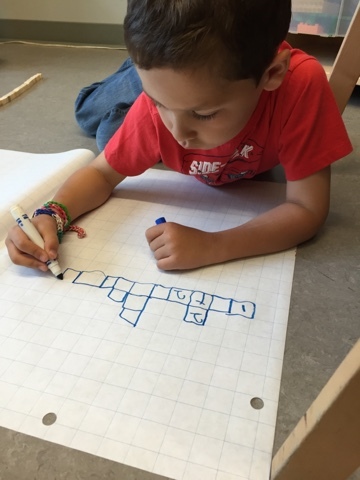 Two classrooms from elsewhere in the province decided to also explore the problem in their classrooms, and tweeted us back their ideas. 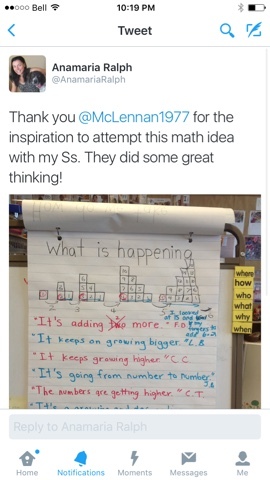 Using social media to share our mathematical thinking and collaborate with other children grows our ideas and abilities as mathematicians as we learn there are many ways to communicate with others and that when we work collaboratively on a task, the outcome is greater and our understanding richer. 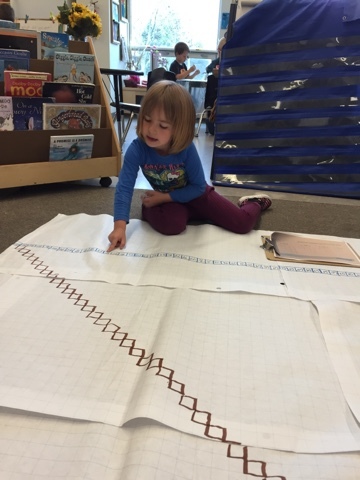 We discussed the ideas shared by Ms. Van der Veen and Ms. Ralph's classes and added their ideas to our own understandings of the pattern. 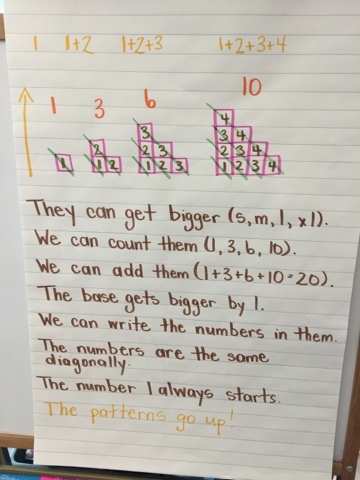 This is what we noticed - the pattern grows and we can represent this with a mathematical equation (1, 1+2, 1+2+3, 1+2+3+4, etc.). 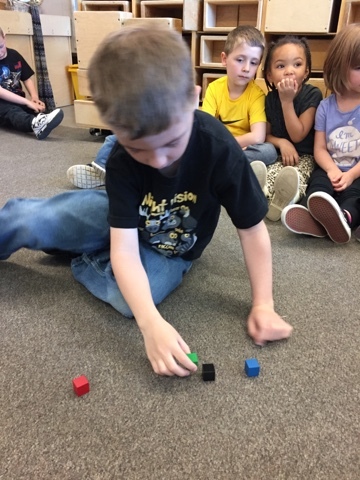 We noticed that the base was growing by one each time and that the number assigned to the figure (e.g., figure 1) matched the number of blocks in the base and edge (e.g., figure 5 had 5 blocks in the base and 5 on the left edge). 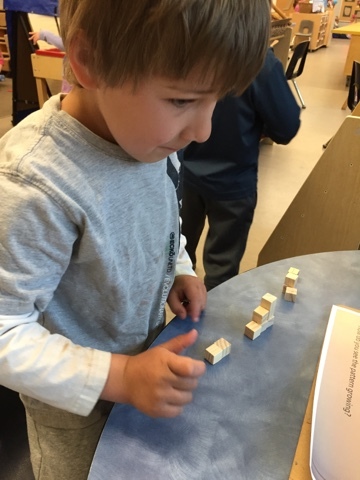 To help us test this theory we used blocks to build what we noticed. 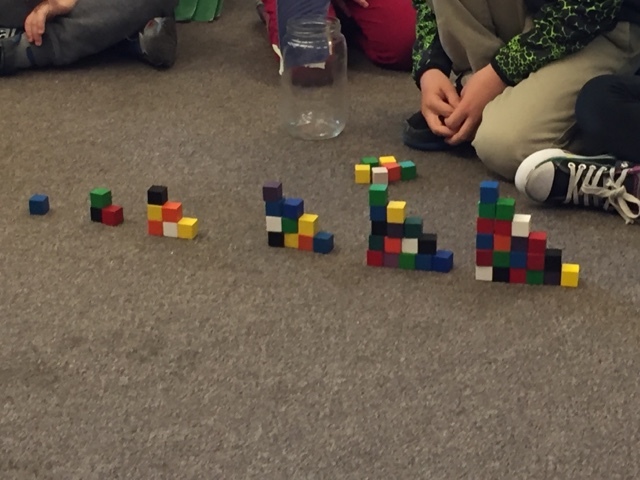 We extended the pattern and built figure 5 and 6. I asked the children to think about the many other figures that might be created in this pattern. The children wondered what the 100th figure would look like. 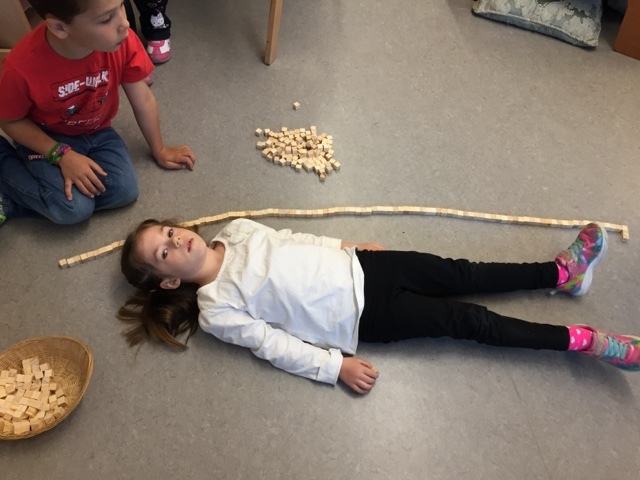 We decided to set this up as a math exploration for the children today. 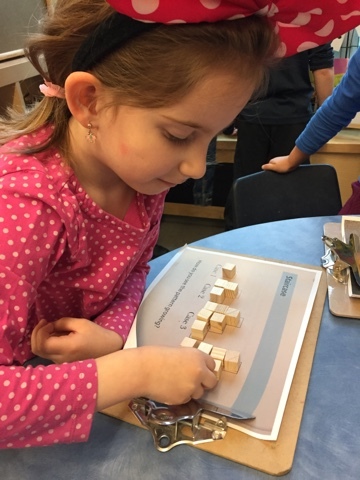 We provided photos of our previous work, the chart paper reference page, mini wooden blocks, and writing materials. The children started by building the original figures in the problem. 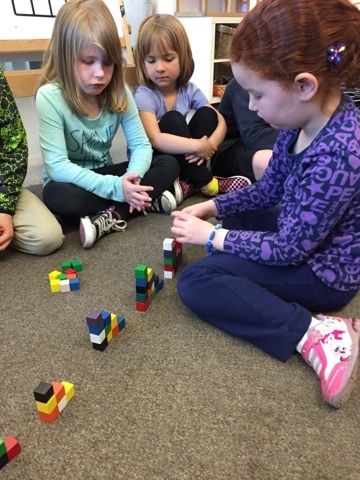 They realized that it was more effective to build the figure flat because building upwards wasn't reliable. The figures would easily tip. One child immediately went to work on building the 100th figure. She understood the pattern (the 100th figure would have a base and edge each of 100) so she set to work. 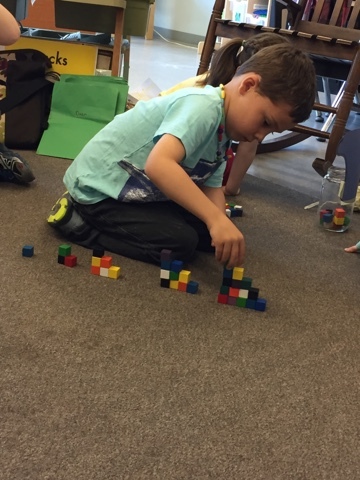 This task required great patience and perseverance because the blocks are small and move easily. Putting them back in a straight line and counting and recounting to ensure that there were 100 took great commitment. Other children became curious and stopped by. "Is the base longer than you?" he asked and we measured to find out. Once the base was completed the left edge was started. 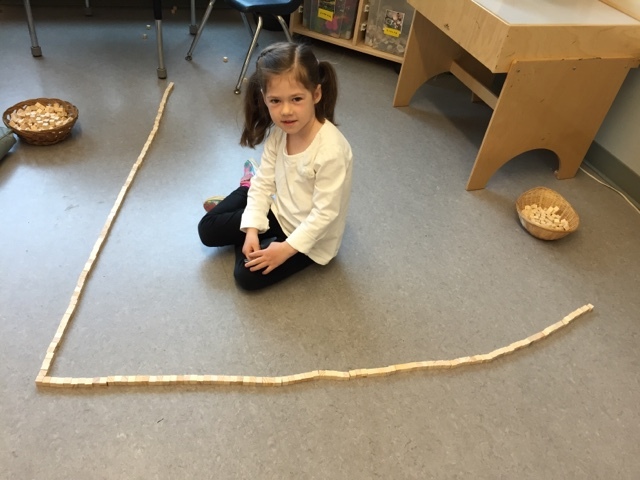 Again, counting out 100 blocks and lining them up in a straight edge was a complicated task and it required great patience and persistence with the task. She did it! Yeah! This is what the 100th figure's base and edge would look like! Now onto filling it in. Would we have enough blocks? 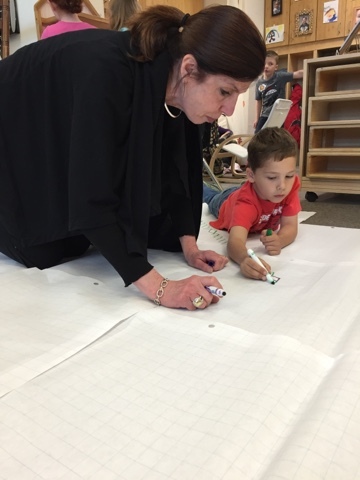 ...and together and together and together... Mrs. Tullio stopped by to assist. 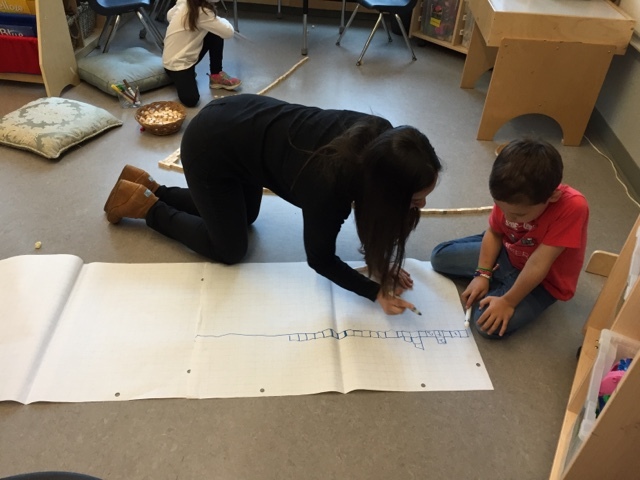 She was interested in learning about what the children were doing and they were so eager to share their thinking with her. They recognized the significance of this project. Once the base and edge were counted out and drawn, we decided to draw the other outside edge. 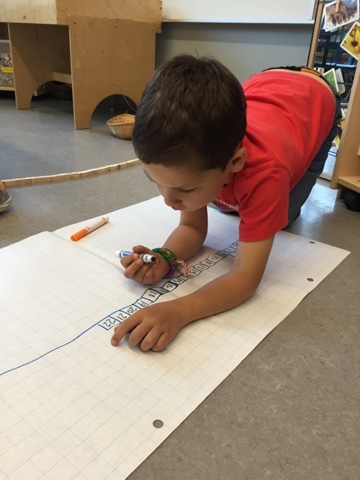 Because we used chart paper and lined the papers up when taping them together, we didn't feel we needed to draw each individual block inside the figure. 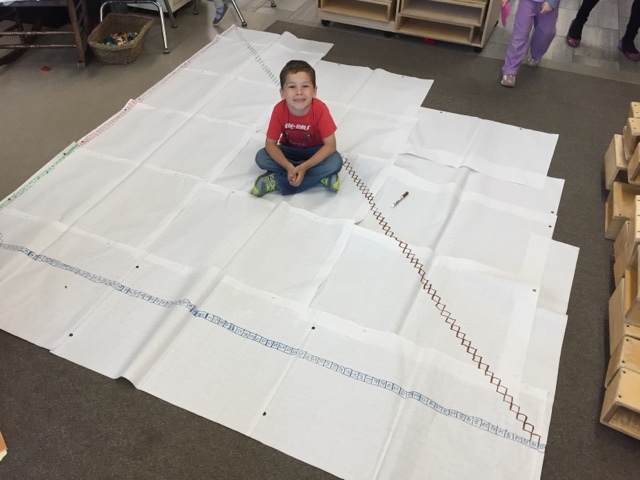 Other friends stopped by to watch the work unfolding and to double and triple check to ensure we had 100 squares in our base and 100 in our edge. He did it! This is what the 100th figure would look like! You can tell just how large this is with him sitting inside. 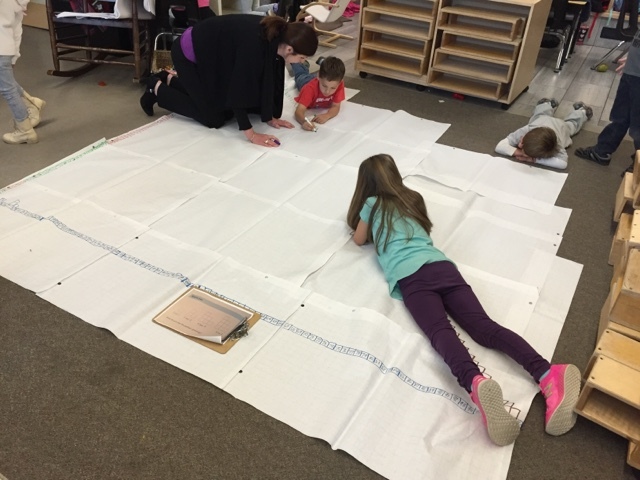 Each paper is an easel sized paper and the total papers taped together is almost the size of our large carpet. 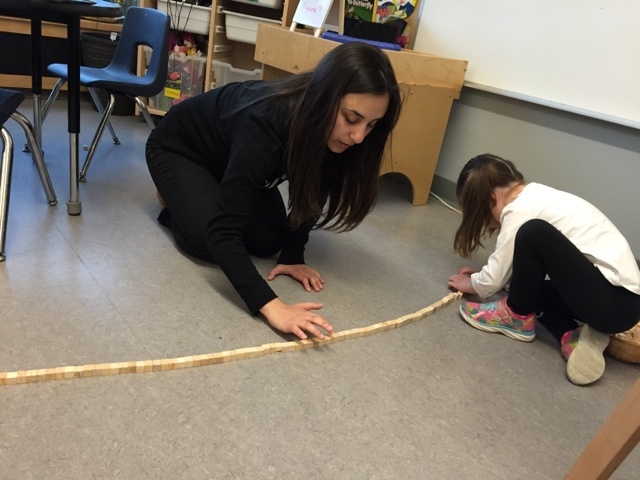 Taking our time to think slowly and deeply about this problem, and working together with people both inside and outside our school, helped us to accomplish an incredibly impressive feat for kindergarten children. We couldn't be more prouder and wonder what problem we will solve next! I am so proud of our little acorns. They are doing big acorn work. 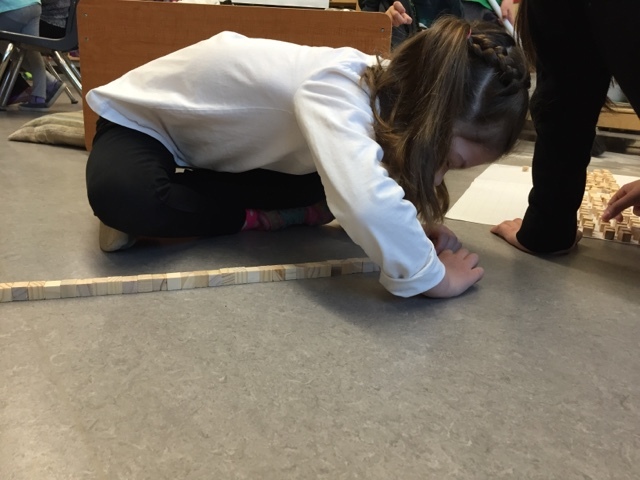 I am excited to see what math challenge they will tackle next. Mrs. McLennan your work is quite impressive. 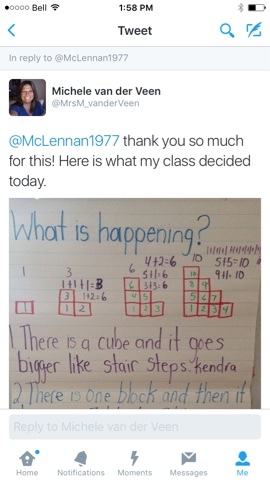 Your class is certainly developing a mathematical mindset. Children are so very competent. 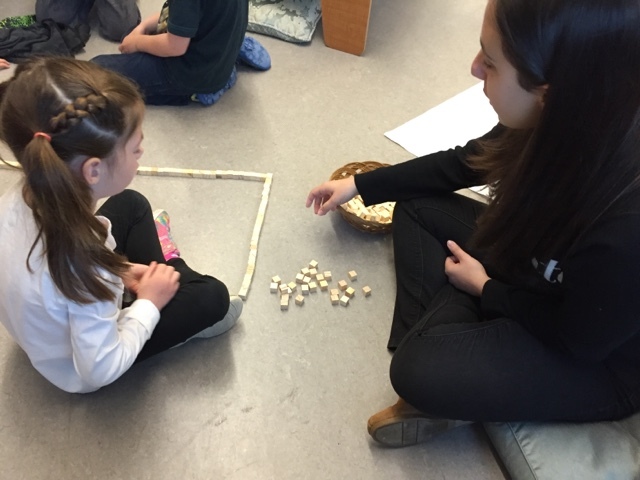 Thanks for sharing and contributing so beautifully to inspiring so many others do also do amazing things to respond to the curiosities and rich potential of the young mathematicians!